With invitations to so many worthy medical causes and events, it becomes a difficult decision to figure out how to devote your time and energy. But a colleague who was diagnosed with a blood cancer gave me a laser focus on an upcoming event. 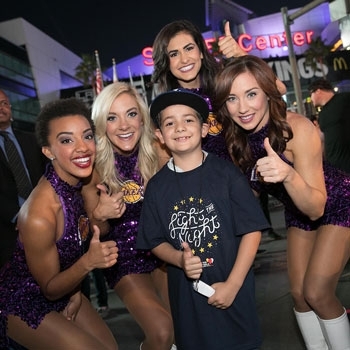 With that as a goal, UCLA Health became a presenting sponsor of the Leukemia & Lymphoma Society’s Oct. 22 “Light the Night Walk” at L.A. Live in a mission to raise research funds to find cures for blood cancers. More than 60 teams composed of hundreds of UCLA Health staff members, patients, including many cancer survivors, family members, researchers and community members participated by carrying red, white or yellow lanterns in support of loved ones. 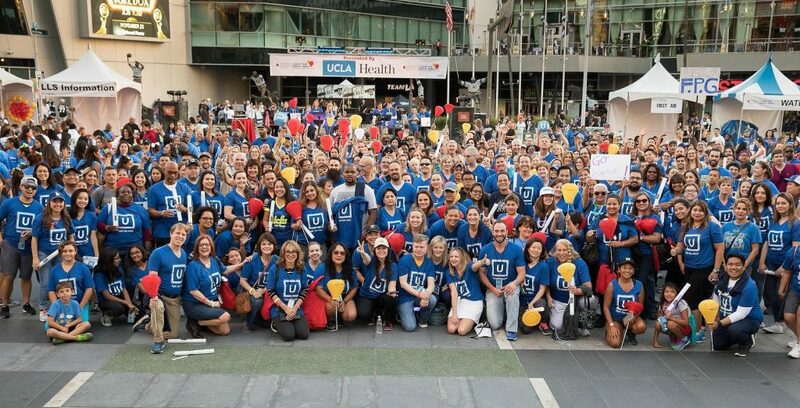 “Over the years, the society has funded about 50 UCLA researchers with almost $10 million, and its support has been vital to the development of many treatment breakthroughs, including Gleevec, a pill for a common form of adult leukemia that has dramatically improved five-year survival rates,” said Johnese Spisso, president of UCLA Health and corporate walk chair for the Los Angeles event. Jassmine says of her son, “He’s the strongest little boy you’ve ever seen. Every month he has to have a spinal puncture for his chemotherapy. When new children come to the clinic frightened and crying, Rey offers comfort and reassurance. He shows them his own port and explains that they don’t need to be afraid and that it won’t hurt.” Funds raised from the “Light the Night” will also help improve patient access to treatment and bolster services for patients and their families. Rey, accompanied by Jassmine and her husband, joined other cancer survivors in carrying a white lantern, signifying the power of research and hope for a cure. Supporters carried red lanterns and individuals who commemorated a loved one lost to cancer carried yellow lanterns. I carried a red one for my friend. Another UCLA Health employee, Martin Lingard, also walked at Light the Night with a white lantern. Lingard, a four-and-one-half-year lymphoma survivor, said he was “proud and pleased to be carrying a white lantern” to raise awareness and research funds that will lead to better therapies and cancer-fighting drugs with fewer damaging side effects. The American Society of Hematology explains on its website that blood cancers affect the production and function of the body’s normal blood cells. Most of these cancers start in the bone marrow where blood is produced. Stem cells in the bone marrow mature and develop into three types of blood cells: red blood cells, white blood cells, or platelets. In most blood cancers, the normal blood cell development process is interrupted by uncontrolled growth of an abnormal type of blood cell. These abnormal blood cells, or cancerous cells, prevent the blood from performing many of its functions, like fighting off infections or preventing serious bleeding. According to UCLA blood cancer researcher Dr. John Timmerman, the Leukemia & Lymphoma Society is the only organization that focuses completely on blood cancers. 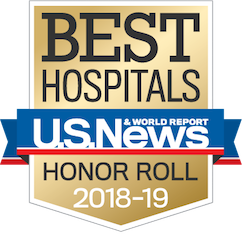 “They want to advocate for new research and bring exciting cures for patients with all different types of blood cancer,” said Timmerman, professor of medicine in the division of hematology and oncology at UCLA Health. Approximately every 3 minutes someone in the United States is diagnosed with a blood cancer. New cases of leukemia, lymphoma and myeloma are expected to account for 10.2 percent of the estimated 1,685,210 new cancer cases diagnosed in the U.S. in 2016. Timmerman says the future holds promise in that it may not be long before immunotherapies begin to take the place of chemotherapy in some cases. “For some lymphomas, we are seeing prolonged remissions with immunotherapies such as checkpoint inhibitors or engineered T cells. Combining immunotherapy with other targeted therapies is also showing exciting results in the laboratory and early clinical trials. In some cases, these treatments are looking to be just as effective as traditional chemotherapy,” he says.